The # 1 Networking Question to Avoid. . . .
What is the Number 1 Question to Avoid when beginning a networking conversation? "Do you know of any job openings?" If the answer is “NO,” it’ll be a short conversation. Instead of asking this conversation-killer, plan ahead. Plan to ask questions that draw your networking contact out. Ask questions that get him or her talking, and sharing information. Remember, your purpose, in a 1-to-1 networking conversation or meeting, is ultimately to learn what the other person knows about potential employers, helpful people, beneficial professional associations, and other good sources of information that could lead to employment. Design your questions to. . . . Equally importantly, get your networking contact thinking about you long after your conversation is over so that when your network contact does come across a job lead, or meets a person who could be helpful to your search, he or she will think of you! Ask open-ended questions that get the networking conversation flowing. Organizations or companies People Professional associations "Headhunters"
(1) Begin by telling your network contact about yourself: Why your are on the market for new employment. This is, in fact, your “L”vator speech. 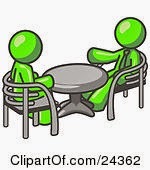 (2) Then, tell the person you are meeting with why you requested to speak with them. This is an opportunity to complement the person about their knowledge of the industry, their reputation for being a leader or a fountain of information when it comes to their profession, a real “Who’s Who” when it comes to knowing “everybody who’s anybody” in the industry. . . you get the point. A little “schmoozing,” as long as it is sincere, can work to your advantage! Caution: Your goal in a networking is to learn. So set the stage and STOP TALKING ABOUT YOU! In a networking conversation, you should only talk about 40% of the time! The point is to get your networking contact to share information; he or she should be talking the most. A good guideline is that he or she should be doing at least 60% of the meeting! Target Question 1: Are you aware of any good organizations I should be looking into? This gets your contact thinking about companies which have impressed them. Question 1 Variation: Tell me about your organization. If the person is employed, this is a natural place to begin. It gets the conversation going and allows your contact to be helpful. 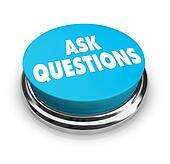 Follow-up with your question about additional organizations your contact thinks well of. Target Question 2: Are there people you know who it might be good for me to talk with? Receiving a referral to your contact’s contacts, is networking at its best. Here, you begin to meet people whom your contact believes can be helpful to you. As contacts refer you to contacts, and they in turn refer you to their contacts, the multiplier effect occurs. Talking with people to whom you are referred is the best route to finding opportunities on the hidden market, and to your next position. Importantly, in order to know how to proceed, clarify if he/she will make the referral, or if you will simply use the name of your contact in contacting the referral. Target Question 3: Are you aware of any good professional associations or groups that you have benefited from participating in and that I should attend? Professional associations provide a wealth of opportunities to a job seeker. You meet people in companies in your profession with whom you can schedule meetings, or contact for information. Give them a call the next day, and they’ll take your call. You hear the “who’s who's” of your industry, the association meeting speakers, present topics that are relevant and timely to your profession, giving you additional information to discuss in interviews. Target Question 4: Have you worked with any “headhunters” (executive search firms) or employment agencies that you found particularly effective? While no one but you can or should be responsible for managing your career and your job search, headhunters are another avenue to employment. Finding 1 or 2 who you can work with is simply taking advantage of another avenue to employment. Caution: Don’t rely solely on the use of an executive search firm - headhunter - or employment agency to “find you your next position.” However, the use of a firm to also identify opportunities, in addition to those you generate, is a good strategy. Asking questions that draw your networking contact out, encouraging them to share information and refer you to others, will yield returns in leads to opportunities, and lead you to the door of your next position!